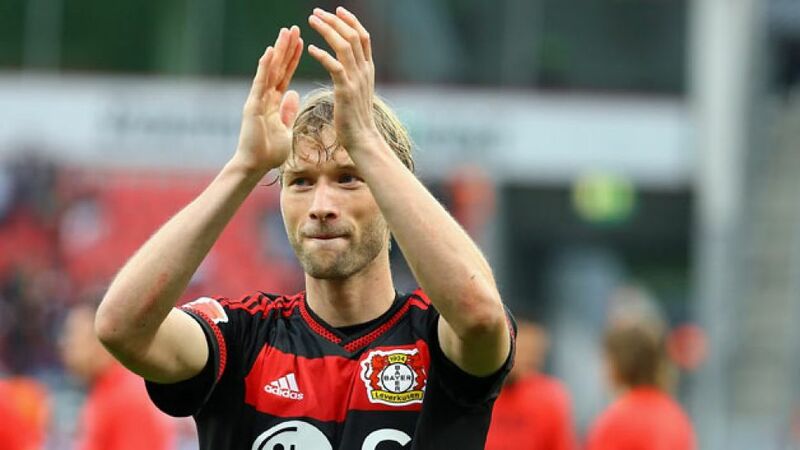 Leverkusen - A wave of emotion swept over Bayer 04 Leverkusen club captain Simon Rolfes in his final outing at the BayArena before hanging up his playing boots at the end of the current campaign. Simon Rolfes: "You don’t really know how you should react. I was looking forward to it though, because I’ve spent many happy years here. It was a special feeling when my number went up on the board - you can’t describe it! It was definitely very emotional." Stefan Kießling: "Simon is a quiet guy. It's tough for me that he's going. I played with him for many years and it's hard to talk about it. He is a quiet guy, but he always had his eye on what he wanted to do, both on and off the pitch." Oliver Baumann: "We had a good chance to score at the start, but Leverkusen had the better of the opportunities after that. The 1-0 was flying all over the place. I tried to react, but the ball changed direction again at the last moment. I could have saved it with a bit of luck, but Lady Luck wasn't on my side in this instance. We now want to produce a good performance at home to [Hertha] Berlin [on Matchday 34]." Andreas Beck: The defeat hurts because we were confident of getting something from the game today. We lost the ball too often when we were trying to turn defence into attack. We also had opportunities to score in the first half. It's a shame we fell behind just before half time. We took more risks after that, but that left more gaps at the back for the opposition to exploit. Having said that, we also had chances to hit them on the counterattack."